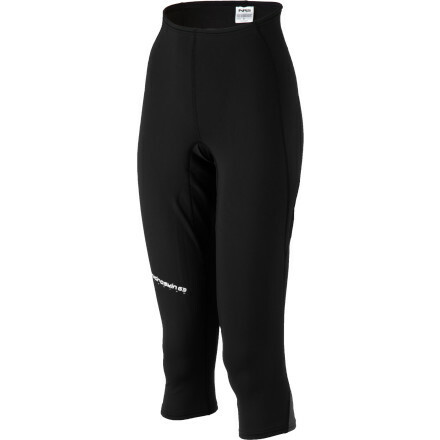 NRS Women's HydroSkin 0.5 Capris - The NRS Women's HydroSkin 0.5 Capris delivers lightweight neoprene insulation and the ultimate immersible base layer. Featuring a mid-rise, yoga-style waistband with extra material on the back panel for maximum coverage and comfort whether you sit or stand during your paddling adventure. The women's NRS HydroSkin 0.5 capris offer just the right amount of warmth for cool days and cool water without feeling bulky or restrictive. In fact, they're stretchy and comfortable. The HydroSkin 0. 5mm Capri by NRS is the perfect in between pant for days when you need a bit more protection than shorts, but not quite a full splash suit. This legging-wetsuit hybrid capri is ideal for stand-up paddleboarding on brisk mornings and kayaking through still waters in colder weather. Designed to keep you warm, heat-reflecting titanium is integrated into the construction to give you a warm insulation while the fleece-like ThermalPlush lining is soft and warm against your skin. And built with performance neoprene and a DWR finish, splashes shed right off the surface and dries quickly. 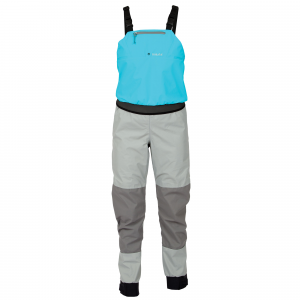 A four-way stretch PowerSpan construction, mid-rise waistband, and form-fitting fit gives you the familiar feeling of a pair of leggings with unrestricted movement and reliable coverage so you can paddle and guide with confidence.